A coterie of aspiring Martians will descend on Washington, D.C. on Saturday (Aug. 3) for the first Million Martian Meeting. The group consists of applicants for the Mars One mission, a one-way trip to establish a colony on Mars. The meeting will feature talks by Mars Society president and founder Robert Zubrin, Mars One CEO and co-founder Bas Lansdorp, and five Mars One applicants. Lansdorp announced plans for the Mars One mission in May 2012. The nonprofit Mars One Foundation, based in The Netherlands, plans to land humans on Mars in 2023. Teams of four people will be launched to the Red Planet every two years, and anyone over the age of 18 is eligible to apply. As of May 7, about 78,000 people had applied for the one-way trip. The applicants' Facebook group, the Aspiring Martians Group, is organizing Saturday's meeting. After an opening address, Zubrin will address the group via Skype, followed by a guest speaker. Then there will be a screening of the film "One Way Astronaut," an independent documentary about Mars One applicants. Later, five applicants will make presentations, and Lansdorp will give a talk to conclude the event. 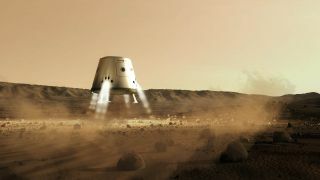 Mars One plans to launch and land an unmanned supply mission to the Red Planet in 2016, carrying 5,00 pounds of food and other equipment. An exploration rover is slated to follow in 2018 to scout out the best spot for a human colony. In 2021, the organization plans to install a Mars base consisting of two living units, two life-support units, a second supply unit and two rovers. The first crew of four is slated to launch in September 2022, and scheduled to set foot on Mars in 2023. Mars One estimates the cost of landing the first four settlers will be about $6 billion. It plans to fund most of this by selling advertising for a reality TV program that would document the mission's progress, from astronaut selection through the settlers' first few years on Mars.